Ter Stegen:The FC Barcelona keeper was a huge hit when he played all 90 minutes of Germany’s friendly with England, which doubled as a farewell to Lukas Podolski, who scored the only goal of the game. But despite the glowing praise for his clean sheet in Dortmund, Ter Stegen wasn’t used in the World Cup qualifier, Bernd Leno getting the nod instead, which ended in a 4-1 victory over Azerbaijan. Denis Suárez: The Spain U21 team had a couple of warm-up matches for the European Championships in Poland, and in the first Denis Suárez came off the bench to score in a 3-1 over Denmark, He also played all 90 minutes of an impressive 2-1 win over Italy in Rome. Neymar Jr: The Brazilian scored in back-to-back wins for Brazil that ensure that the five-time champions are the first team to ensure qualification for the 2018 World Cup. The Barça star scored a magnificent chipped goal and also gave an assist in the 4-1 win in Uruguay and was wearing the captain’s armband when he added one of the three goals against Paraguay that confirmed next summer’s trip to Russia – an absolutely stunning coast-to-coast run down the left before tucking away in style. Luis Suárez: It wasn’t a great week for Uruguay, who lost both their games, but the charruas have still held on to one of the top four places that offer direct berths in the finals. Suárez sat out the defeat in Brazil through suspension, but was back for the game in Peru and involved in the build-up to the opening goal. But Uruguay ended up losing 2-1 in Lima. Leo Messi: The striker scored the only goal of the game against Chile, a fifteenth minute penalty, but missed the second fixture in Bolivia as he served the first of a four-match suspension. That game ended in a 2-0 win for the home side in the altitude of La Paz, and it means that as things stand (with four match days left) Argentina would be going into a playoff against the winners of the Oceania zone. Javier Mascherano:‘El Jefecito’ played all 90 minutes of the game with Chile and was involved in the build-up to the move that ended in Argentina’s penalty, assisting Di Maria from the edge of the area. But he’d end up getting booked therefore suspended for the game in Bolivia, so he returned to Barcelona earlier than expected. Arda Turan: Captained Turkey to an important 2-0 win over Finland to keep their World Cup qualification hopes alive. They’re third at the half-way point in Group I – two points behind Iceland. A groin problem meant that Arda sat out Monday’s friendly with Moldova. Ivan Rakitic: The midfielder played a key role in a win against Ukraine to put his team in a strong position in Group I. Rakitic provided the assist for the solitary goal in the game and was substituted after 79 minutes. He returned to Barcelona without playing a part in his team’s friendly in Estonia. Jordi Alba:The left back was one of the prominent players in Spain’s 4-1 win against Israel, and provided the assist for the first goal after 90 minutes. He also set up former Barça colleague Gerard Deulofeu’s goal to seal a 2-0 win in Paris, shortly before being replaced by Nacho Fernandez four minutes from the end. Gerard Piqué: The centre back also featured in the whole of the win against Israel in Gijón and the friendly victory in Paris. Sergio Busquets: Just as he is under Luis Enrique, the Catalan is an automatic first choice starter for Spain boss Julen Lopetegui. He was on for all 180 minutes of Spain’s two wins this week and produced a sublime piece of skill in the build-up to Gerard Deulofeu’s late goal. Andrés Iniesta: Was on for the first 70 minutes of the game with Israel and was widely acclaimed for his performance. If anything, he was even better against France, coming close to scoring on two occasions as he dazzled going forward before being relieved after 56 minutes by Thiago Alcantara. André Gomes: Played 86 minutes of a crucial 3-0 defeat of Hungary that keeps Portugal well in contention for at least a playoff place, although Switzerland currently lead their group by three points. The European champions followed that up with 3-2 defeat in a friendly with Sweden, although Gomes was only on for the last eleven minutes of that one. Jasper Cillessen: Although many were suspecting that Cillessen might be the man for the job, it was Jeroen Zoet who played in goal as Holland tumbled to 2-0 defeat in Bulgaria – a result that leaves their qualification chances hanging on a knife-edge and cost manager Danny Blind his job. 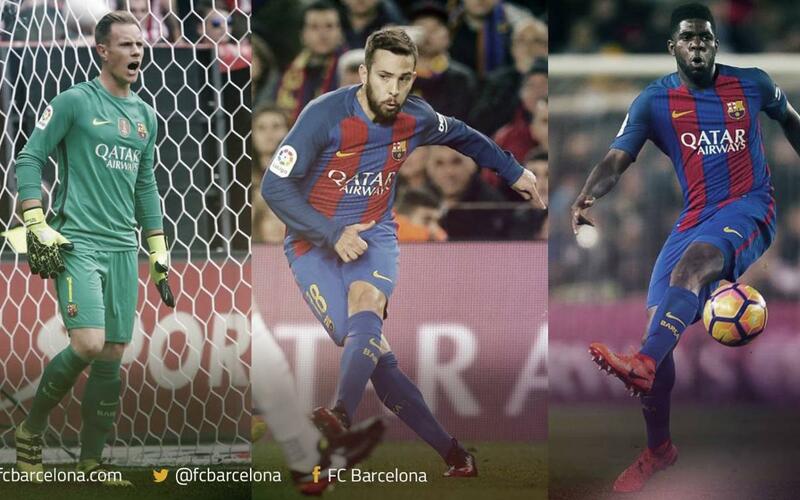 The Barça keeper was also an unused substitute in the 2-1 defeat to Italy. Samuel Umtiti: France march on in Group A with a 3-1 win over Luxembourg and Umtiti featuring in all 90 minutes of the game. The defender was also on for the full stretch as Les Bleus lost 2-0 at home to Spain, this time in a friendly.